The lack of personal accountability is a problem that has resulted in an epidemic of blame, victim thinking, complaining, and procrastination. No organization—or individual—can successfully compete in the marketplace, achieve goals and objectives, provide outstanding service, engage in exceptional teamwork, or develop people without personal accountability. John G. Miller believes that the troubles that plague organizations cannot be solved by pointing fingers and blaming others. Rather, the real solutions are found when each of us recognizes the power of personal accountability. In QBQ! 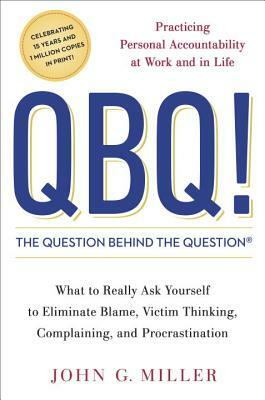 The Question Behind the Question®, Miller explains how negative, ill-focused questions like “Why do we have to go through all this change?” and “Who dropped the ball?” represent a lack of personal accountability. Conversely, when we ask better questions—QBQs—such as “What can I do to contribute?” or “How can I help solve the problem?” our lives and our organizations are transformed. QBQ! was written more than a decade ago and has helped countless readers practice personal accountability at work and at home. This version features a new foreword, revisions and new material throughout, and a section of FAQs that the author has received over the years. John G. Miller is the founder of QBQ, Inc., a development company that has worked with hundreds of Fortune 500 and other companies and government and nongovernment organizations internationally. Miller is also the bestselling author of Flipping the Switch: Five Keys to Success at Work and in Life and Outstanding! 47 Ways to Make Your Organization Exceptional. He lives in Denver. Learn more at http://qbq.com.